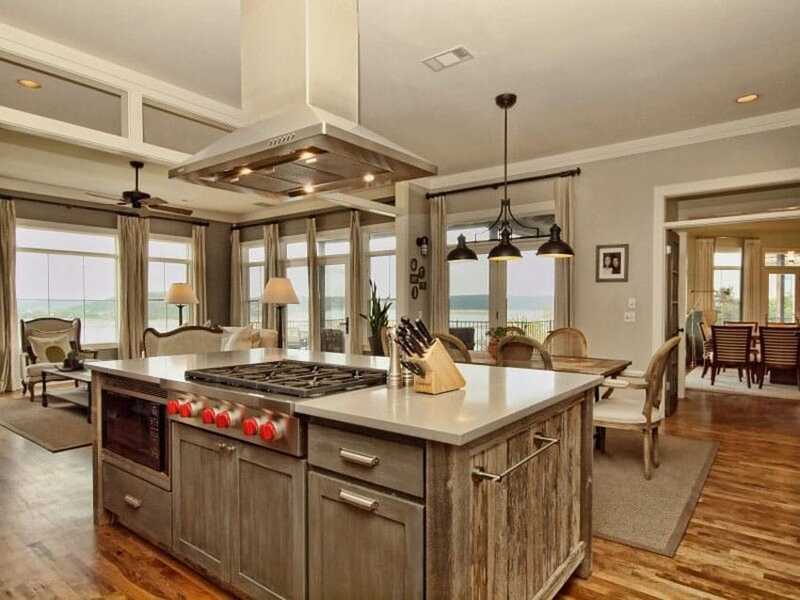 Welcome to our gallery of beautiful reclaimed wood kitchen islands. 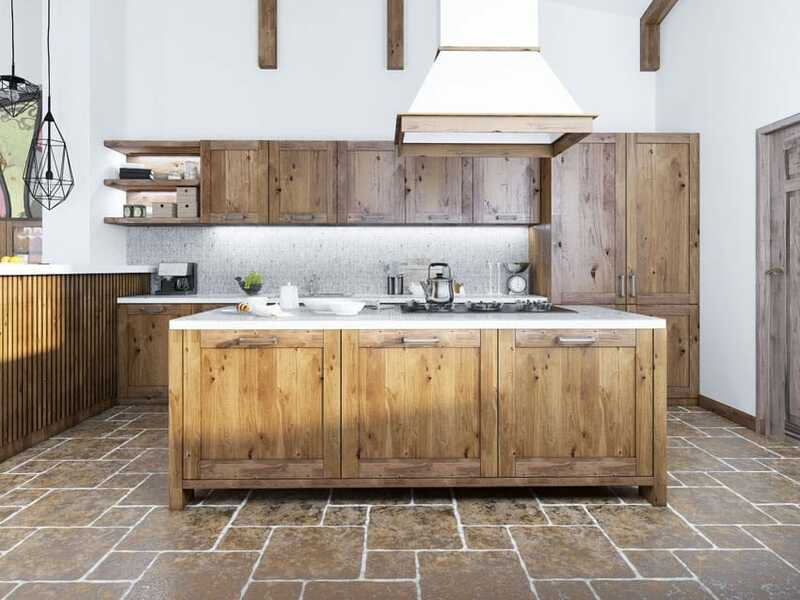 Adding a kitchen island with reclaimed wood is a great way to add a rustic natural style to your home. 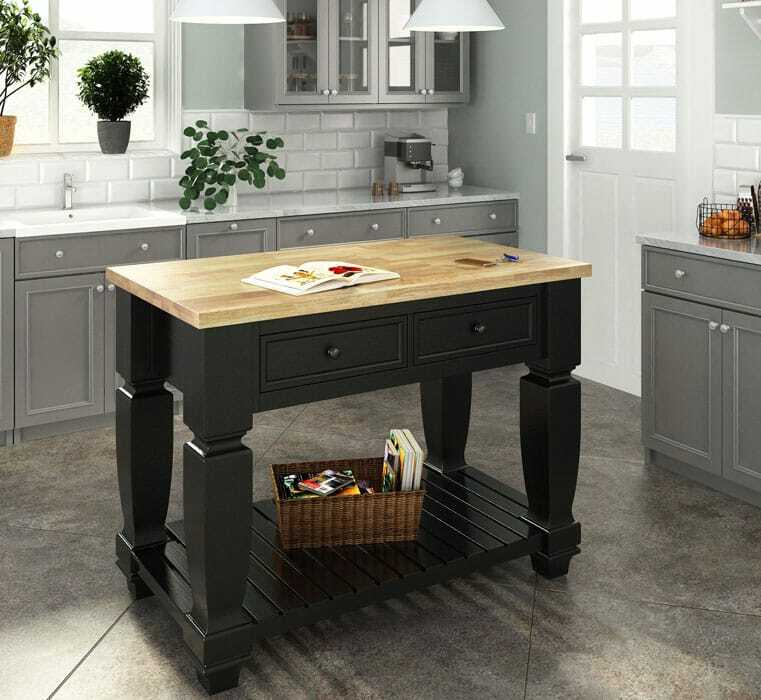 custom wood kitchen islands are great conversation pieces, can increase your home’s resale value and help you add your own personal style to your room. 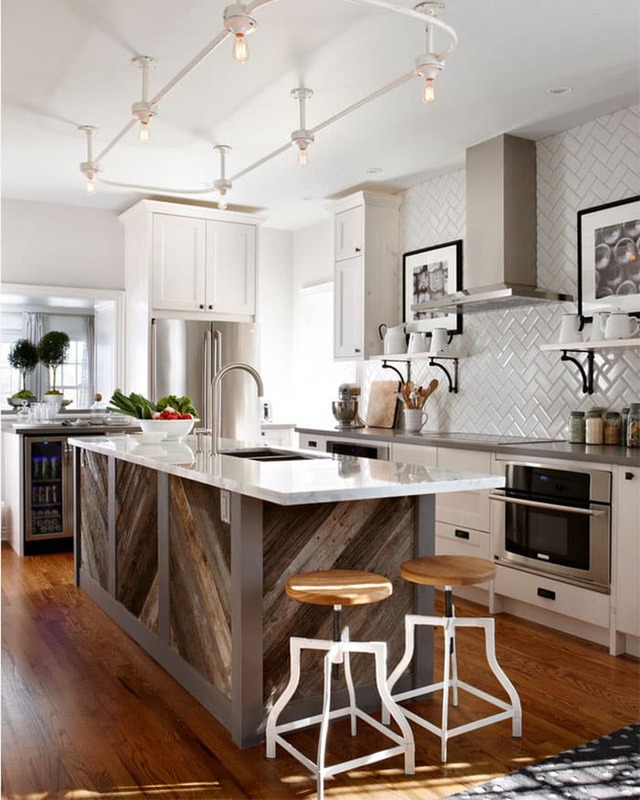 Below are some gorgeous ways designers are using reclaimed wood kitchen islands to create an inviting kitchen space you’ll love. 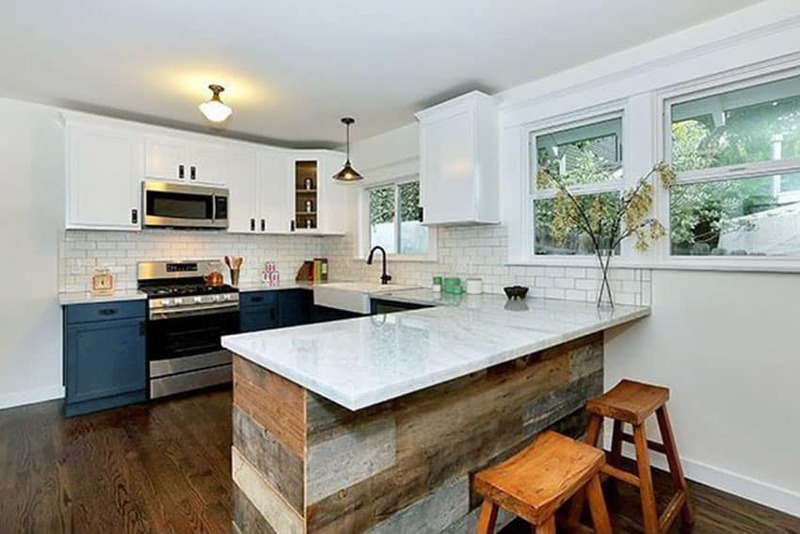 In the picture above the diagonal linearity of the reclaimed wood kitchen island is echoed by the diagonal setting of the subway tiles on the kitchen backsplash. With grey metal edging, the kitchen island is topped with a slab of white marble and embedded with a chrome-finished wash basin and faucet. Antique wrought iron brackets support the open shelves alongside paneled white kitchen cabinets. The industrial filament bulbs connected with painted metal conduits lend an industrial feel, while the white lantern pendant lamps over the dining table give a homey, classic touch. 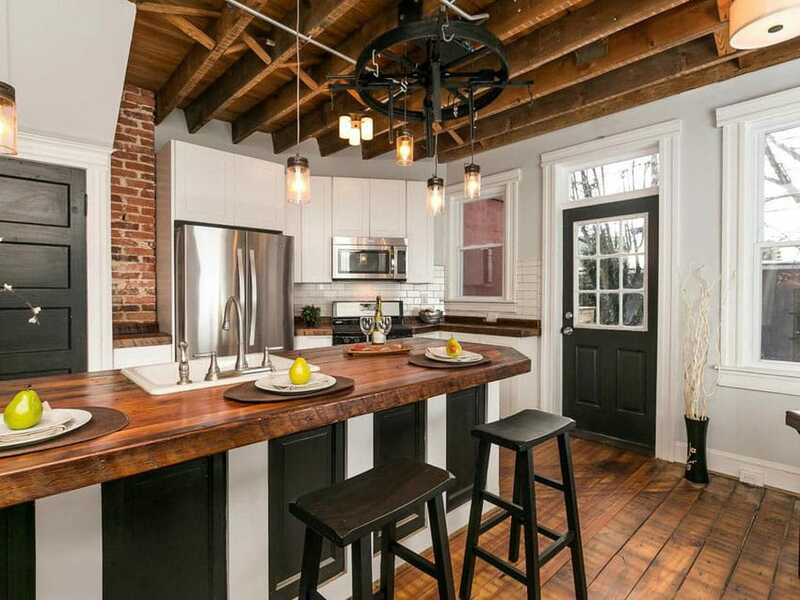 From the opposite vantage point you can see how this beautiful kitchen design with reclaimed wood island acts as a breakfast bar with bar stool seating for two. 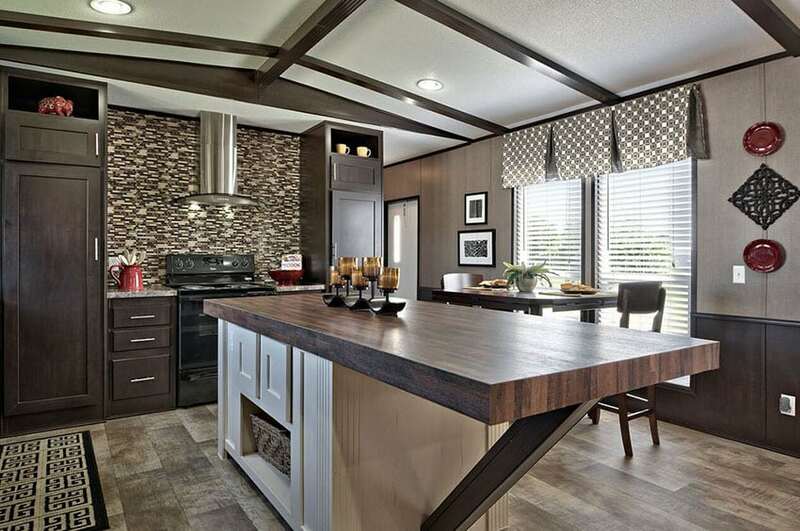 The white shaker cabinetry pairs expertly with the dark wood grains and provides great contrast to the space. The reclaimed barn wood kitchen island has a cabinet topped with a white quartz countertop and embedded with a stove top. 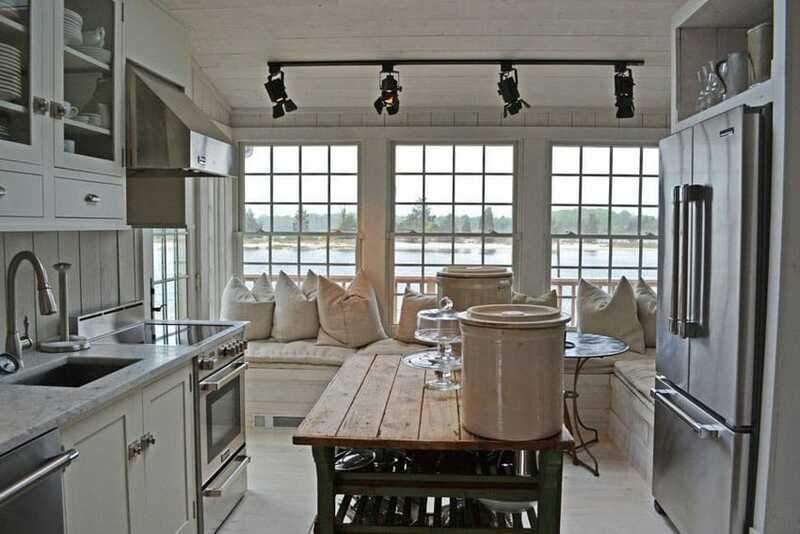 The open concept between the kitchen, living room and dining room reflect laidback New England style, especially with wide views of the sea through floor to ceiling windows. Classic white lampshades and a trio of black iron pendant lamps over the dining table add to the effect, while the range hood hanging over the kitchen island lends an air of modernity. Reclaimed wood in dark grey make this modern kitchen a marvel of Scandinavian style. 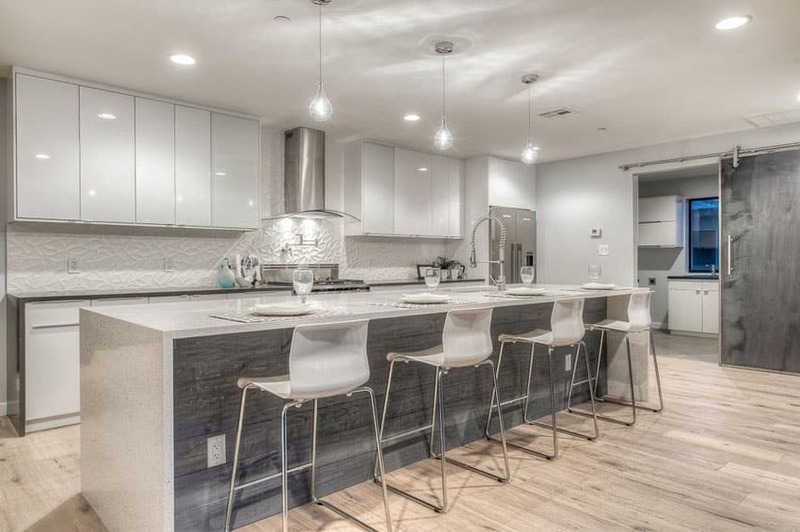 Topped with a speckled white quartz countertop and modern barstools, the backsplash also adds texture to this kitchen with its cracked white surface. Plain glossy white cabinets with stainless steel appliances accentuate the grey wood alongside the lighter grey wood used for the flooring. Three tiny hanging tear drop bulbs complete the Scandinavian cool look of this kitchen. See more interesting kitchen island with seating ideas here. 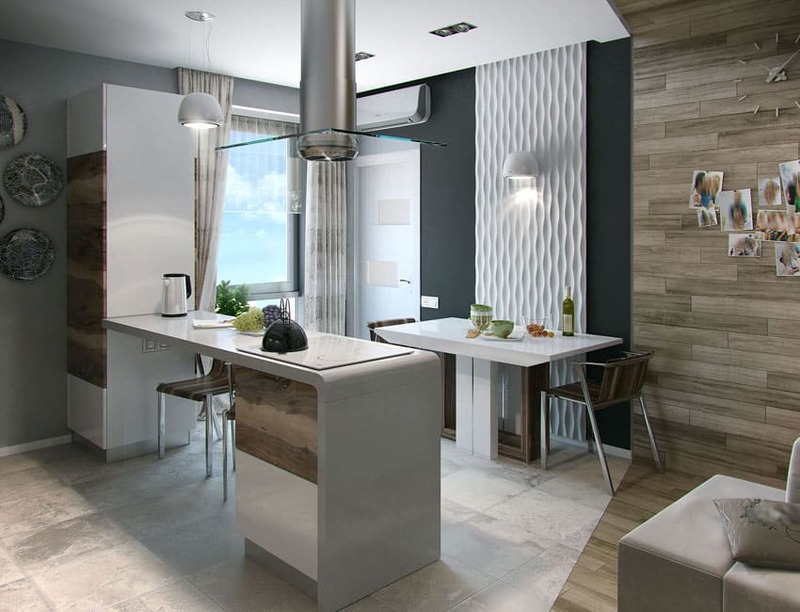 Using reclaimed wood in a cool grey hue matches with the clean white modern look this kitchen is going for. The main contrasting kitchen island features a fold of white solid surface over the reclaimed wood and continues unsupported all the way to the end of the breakfast nook. The white paneled cabinets at the back wall are simple and help accentuate the wood’s hues. The plain white back wall is also illuminated with strip pelmet lighting. The multi-hued reclaimed wood kitchen island adds a touch of kitsch to this Contemporary Classic kitchen with its subway tile backsplash, plain white quartz countertop and black polished faucet. Dark blue is used as an accent for the kitchen’s undercounter cabinets and double hung windows to the side bring in light. A modern glass and stainless steel range hood hanging over the kitchen island is softened by a wall of reclaimed wood leading down to the floor. 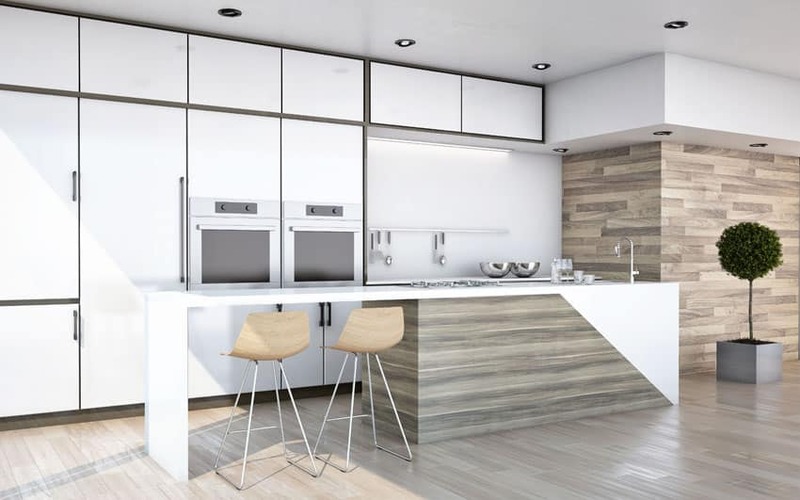 Reclaimed wood accents are also used on the all white kitchen counter while the textured wave panel at the back adds to the modernity of the space. The travertine stone tile flooring adds another cool hue to this modern kitchen. Held up by decorative wood brackets, the green marble countertop rests on a reclaimed wood kitchen island base and is accented by the plain cream cabinetry and trimmings on the back walls. The backsplash in white tile is interrupted by small pops of color in its decorative country style tiles. The whole look of the kitchen is tied together by light wood plank flooring and a trio of bell jar hanging pendant lamps. The chevron layout polished marble floor tiles contrast with the deep heavy lines on the reclaimed wood kitchen island and cabinets. The same type of contrast is mirrored in the polished marble countertops and warm wood strips of the ceiling. Three large hanging pendant lamps in black as well as stainless steel appliances lend modernity to this chic luxe style kitchen. Tumbled stone flooring in a hopscotch pattern bring out the warm hues of the reclaimed wood panels used on the kitchen cabinetry, strips for the taller bar counter and heavy beams on the exposed ceiling. Diamond shaped lamps in black iron contrast with the modernity of the white range hood with rose gold accents. The neutrality of the white and grey mosaic lamps adds a coolness to the kitchen, as does the cool-toned strip lighting over the plain white quartz countertops. 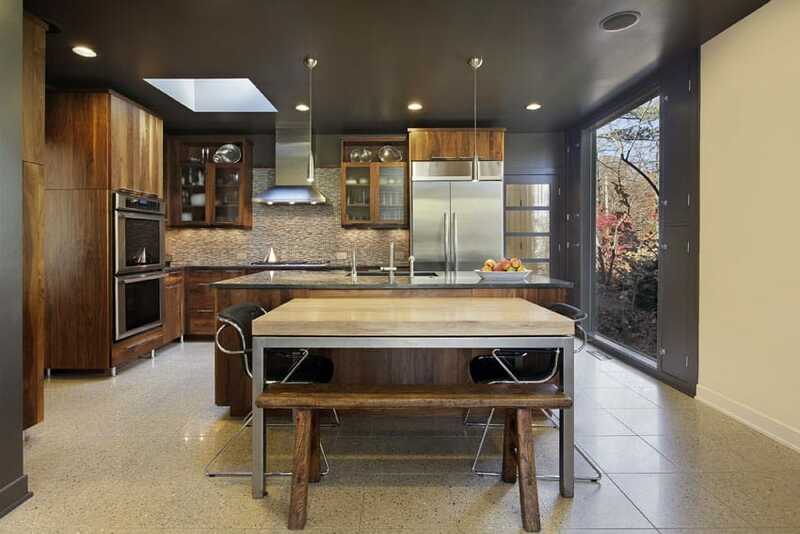 An eclectic gentleman’s lair style kitchen with its heavy dining table and barstools in a dark wooden finish is paired with accents of black steel beams and bars. A cove goes down over the kitchen ceiling, tiled in checkerboard and with a diagonally installed reclaimed wood backasplash. The textile and capiz lamp over the dining table and the wheel and filament lamp over the bar counter reflect the contrast of new and old in this eclectic kitchen. Reclaimed wood planks make up the countertop of the kitchen island, supported by white paneled undercounter cabinetry and repeated on the drawers and wall planks of the kitchen side wall. 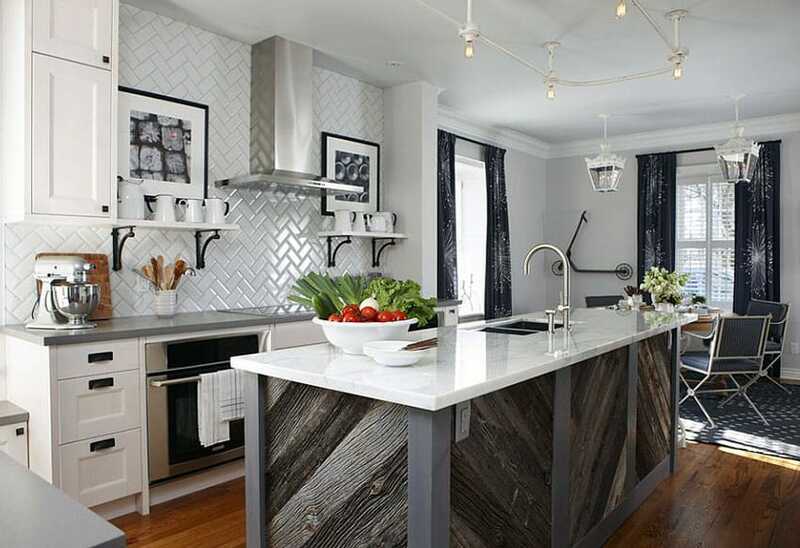 Reclaimed wood is also used for the backsplash and hanging shelves that hang over the black stone countertop. Eight black industrial pendant lamps and grey wood plank flooring complete the industrial woodsy vibe of this kitchen, along with the rough painted white columns in front of the kitchen island, supporting the rough white painted joists. 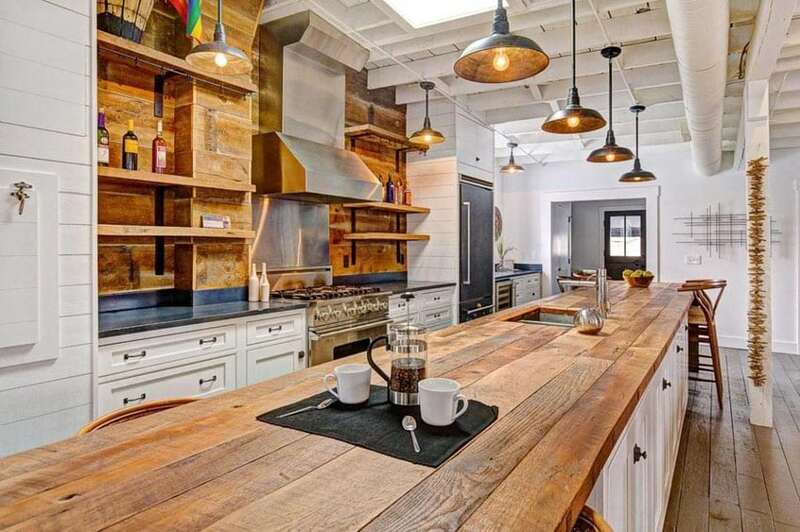 A close-up view of the reclaimed wood kitchen countertop shows the island to double as a breakfast nook. Wood surfaces are repeated on the kitchen’s backsplash and open shelving. The hanging shelves are supported by plain wrought iron straps that match the black powdercoated finish of the industrial pendant lamps hanging over the island and back wall. Roughly painted white wooden ceilings with exposed beams and girders matched with reclaimed wood plank flooring complete the industrial look of this kitchen. Black serves as the accent in this kitchen on its barstools, kitchen island paneling and doors. A small sliver of brick running along the backwall gives this kitchen an old school appeal that is modernized by the linear layout of the subway tiles for the backsplash. White walls and trimming further accentuate the deep colors of the reclaimed wood countertop and flooring. Pendant lamps hanging on an old cartwheel ties together the whole renovated barn look, hanging on the unfinished wooden ceiling complete with exposed wooden joists and struts. This Cottage Style kitchen is softened by its mullioned bay window with plush seating and tufted pillows. 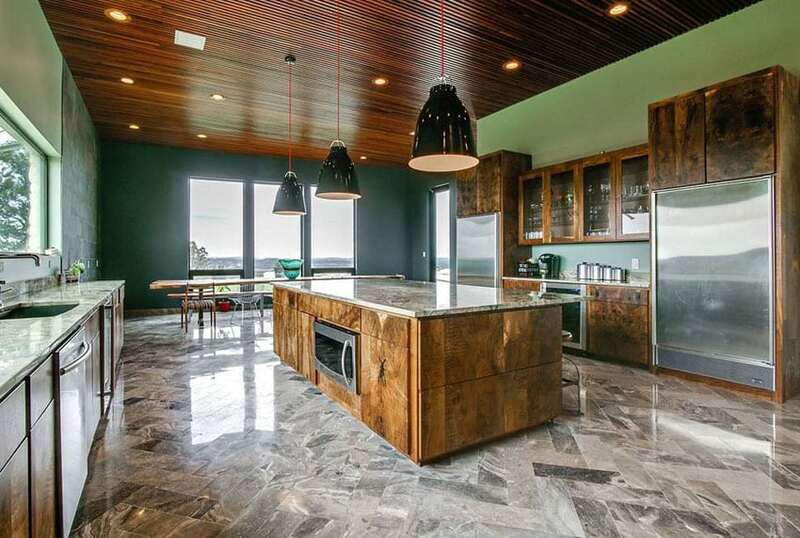 The reclaimed wooden kitchen island at the center is held by rough green painted wood. 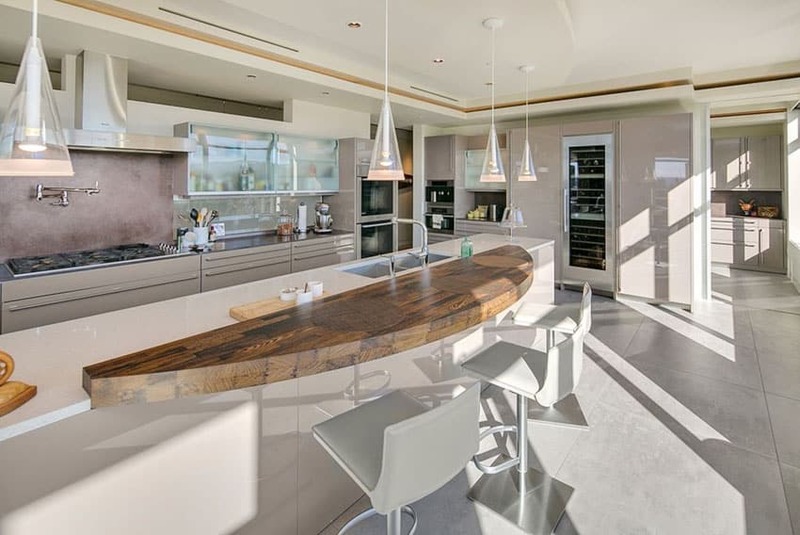 Modern appliances in chrome finish are embedded seamlessly into the casework and accompanied by plain white paneled cabinets and shelves and a marble kitchen countertop. The backsplash of the kitchen is also in a reclaimed wood finish, painted white. This kitchen design with custom island features a raised half-moon shaped reclaimed wood counter contrasting onto the linear white quartz countertop. Glossy white cabinets with long thin handles provide a modern touch, as do the translucent glass overhead cabinets. The bronzed backsplash provides a hint of vintage amidst all the stainless steel appliances and the cone-shaped glass pendant lamps. 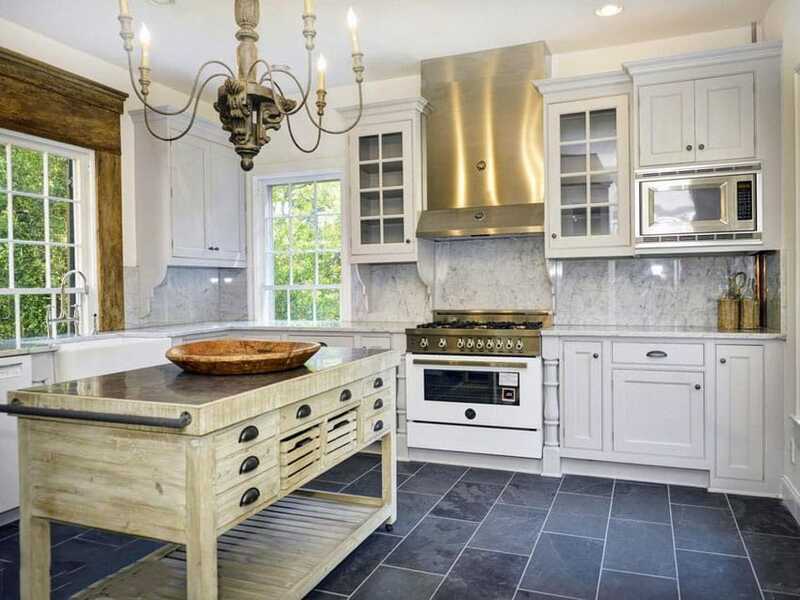 This traditional white cabinet kitchen looks inviting with its reclaimed wood counter island. the main countertop is a beige granite that compliments the stone flooring. While the white cabinets, subway tile backsplash and over island pendant lighting help to keep the space light and bright. 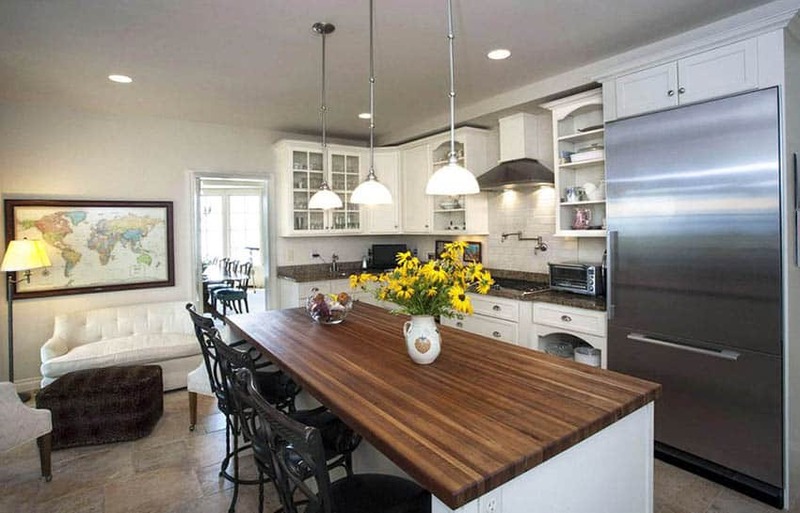 Reclaimed wood kitchen islands can be paired with a contemporary design with great results. This contemporary kitchen with its glossy cabinet drawers and chrome-finished handles are given a warm touch with the L-shaped reclaimed wood countertop put above the speckled granite countertop. 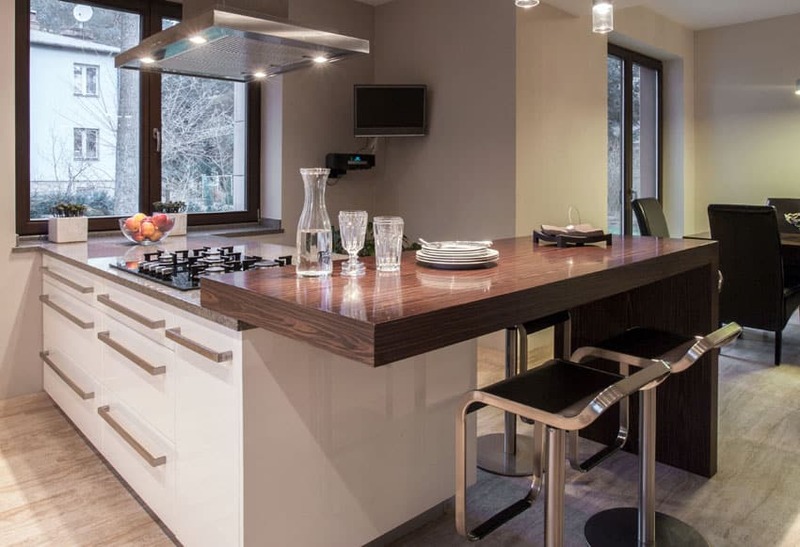 Backless black and chrome barstools add to the contemporary style of the kitchen, as do the fair fine-grained wood flooring and hanging chrome-finished range hood complete with lighting. 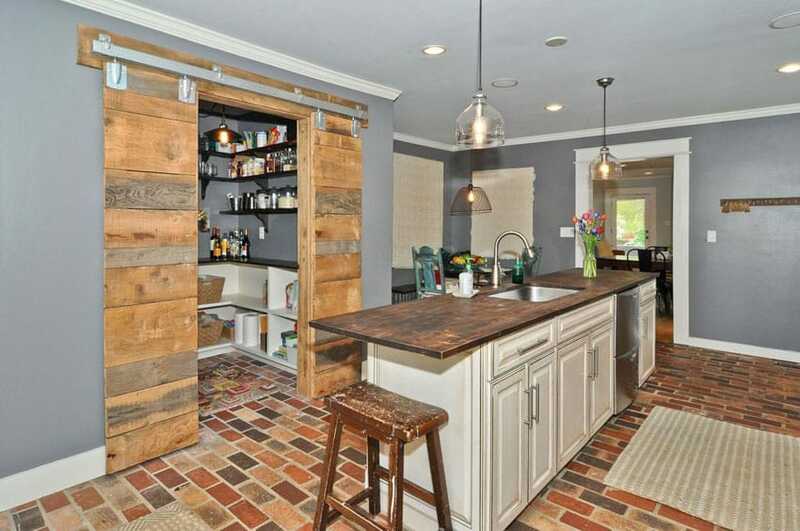 The grey base of the walls and ceiling provide a good background for the reclaimed wood casework and kitchen island, culminating in a heavy reclaimed wood bench at the foot of the breakfast nook. Grey granite countertops and a grey tile strip for the backsplash add to the grey themes of this kitchen, while the light wooden table top resting on chrome-finished metal and speckled beige floor tile add lightness to the deep grey and warm wood feel. Ample natural lighting comes in via the floor to ceiling picture window facing the garden and the skylight near the oven embedded into the casework. 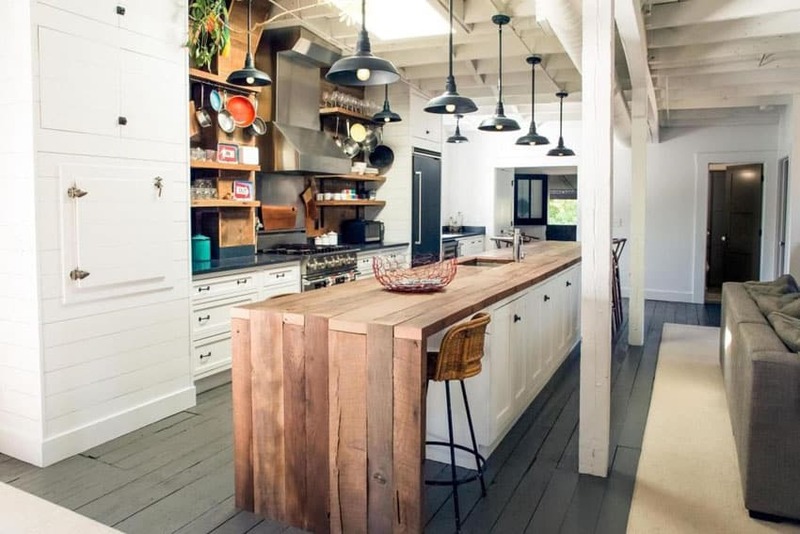 The reclaimed wood in this kitchen is a heavy-grained redwood and was used for the ceiling and ceiling beams, as well as the unpolished kitchen island cabinets and countertop. 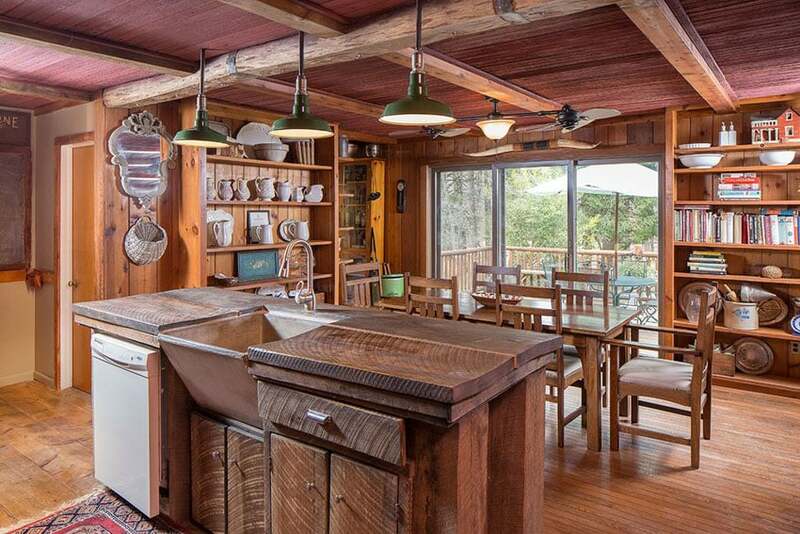 A stainless steel rough cut wash basin adds to the rustic unpolished appeal of this woodsman style kitchen, complete with redwood strip flooring, dining set, book shelves and planks for the back wall. Quirky elements include the double-ceiling fan with glass lamp over the dining table and a trio of forest green industrial pendants over the kitchen island. The contemporary glass sliding doors lead to the outdoor balcony. 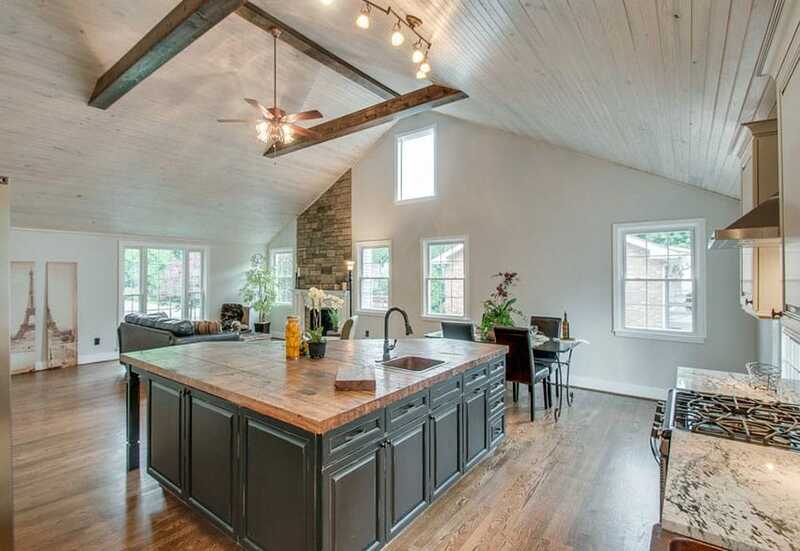 This kitchen features some strong finishes such as the multi colored brick flooring, reclaimed wood barn doors with silver hardware and dark wood kitchen countertop. These textures are toned down by the solid grey hue of the walls and white paneled cabinets, moldings and door architrave. Adding to the Contemporary Rustic look of the kitchen are the wire basket filament bulb and glass bowl filament bulb pendant lamps. A small rug to the side of the kitchen softens up the heavy brick and wood elements. An aged bronze chandelier hangs atop the reclaimed pine wood kitchen counter and is matched by the bronzed stovetop and range hood. White paneled casework and mullioned hanging cabinets bring a classic vibe to this kitchen, while the blue stone tiles on the floor give the kitchen some color. White marble backsplash complete the look of this old school style kitchen placed alongside white mullioned windows, with the largest one in a reclaimed wood framing. Plain grey paneled kitchen cabinets, a white paneled door and white subway tile backsplash are the perfect backdrop to the portable Chelsea style reclaimed wood kitchen countertop resting on top of the black painted wood kitchen island base, fitted with a small shelf underneath. Cool mint green walls and dark stone tiles in a weathered finish add to the cosmopolitan appeal of this otherwise country style kitchen, along with a pair of conical white hanging lamps. The high vaulted ceilings of this kitchen is broken up by exposed wood cross-bracing and hanging copper finished ceiling fan and spotlights. The split face stone finish on top of the fireplace adds an earthy finish to the kitchen and is neutralized by the all white walls. In the same way, the reclaimed wood countertop for the kitchen island and the Calacatta marble countertop for the kitchen back wall are accentuated by the dark grey paneled cabinetry and plinth. 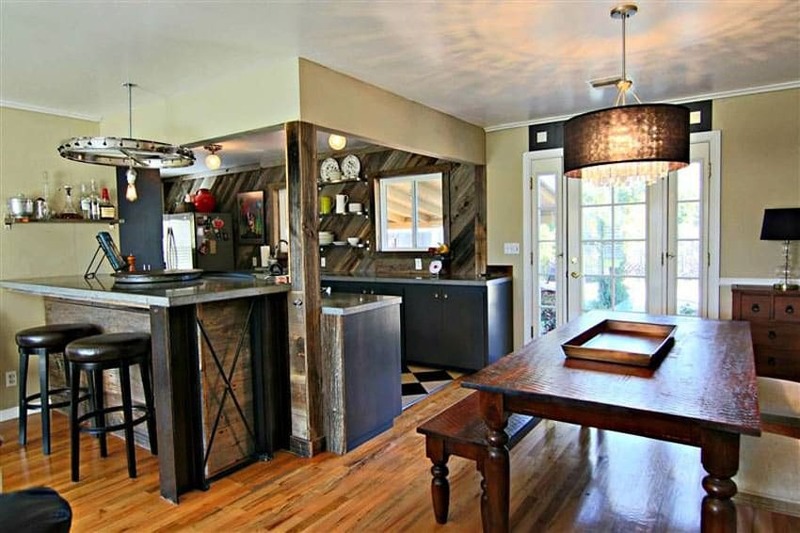 Reclaimed wood kitchen islands should bring out the character and personality of a wood’s surface. 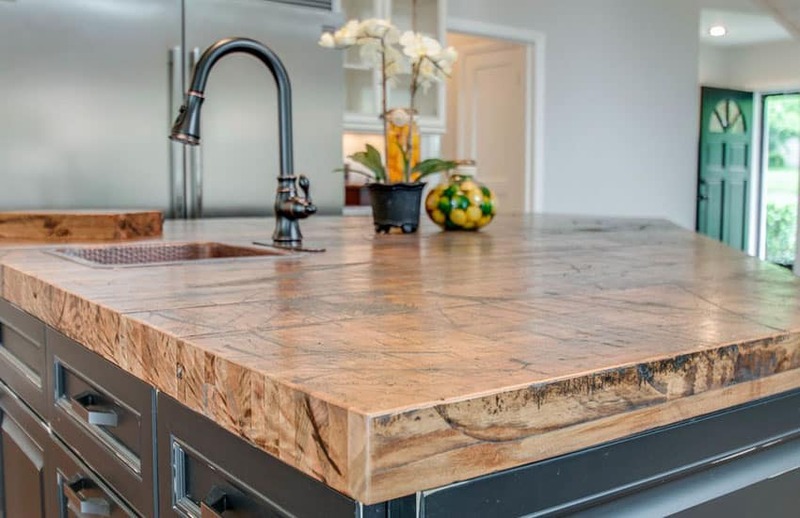 The coarse grain and deep color of the reclaimed wood countertop make it look almost like stone. Supported by grey paneled cabinetry, the wash basin is in a hammered copper, lending a rustic feel to this Contemporary classic. The oiled brass faucet mounted onto the wood countertop also adds to its rustic appeal. The stainless steel refrigerator looming in the background brings back the modernity of the kitchen, as does the mullioned glass hanging cabinets. The reclaimed wood in this modern kitchen island making up the countertop is dark yet polished, giving it a Contemporary Antebellum style. 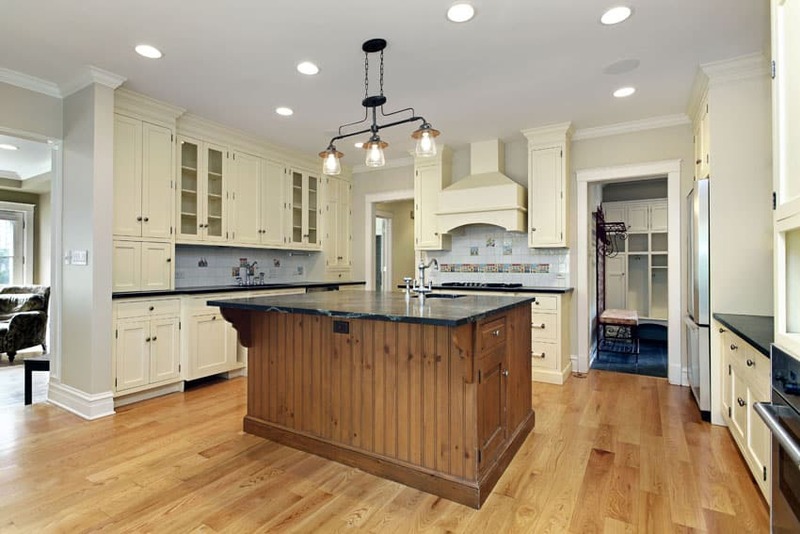 Wood finishes are also used for the cabinets, ceiling beams, and to create the wainscoting on the wall, with the upper area in a lighter fine-grained wood accented with decorative frames and plates. Distressed stone tiled floors tie together the entire look while the diagonal line of the kitchen island support and mosaic tile backsplash add modernity to this dark wood kitchen.